It can be tough as a B2B marketer to sell digital marketing to upper management. The metrics for ROI are blurry and not often times difficult to trace back to end revenue. The idea is scary for many, coming from a generation before sites like Facebook, Google+, and Twitter. However, when used correctly, digital and social media marketing can provide an efficient way to spread word about your company and your product. Let’s look at the way B2B company Corning Incorporated uses digital marketing in their marketing mix. Specifically, we’ll look at how they utilize YouTube and Facebook. Corning Incorporated was founded in 1851, and is the leading producer of glass and ceramics, such as TV displays and aircraft windows. It rakes in about $8 billion in net revenue a year, and boasts over 28,000 employees. One of its big name clients is Samsung Display, whom it recently announced a strategic and financial partnership with. Corning is well-known for their use of YouTube, where they released a series of videos called “A Day Made of Glass”. It displays what glass could do for us in the future when combined with other technologies. The series received an incredible amount of engagement, and Corning has received followers and incremental video views ever since. Though the videos were released quite some time ago, the content Corning posts on YouTube today still receives many views and comments. The content revolves around product announcements, research & development, key industry findings, and company announcements. 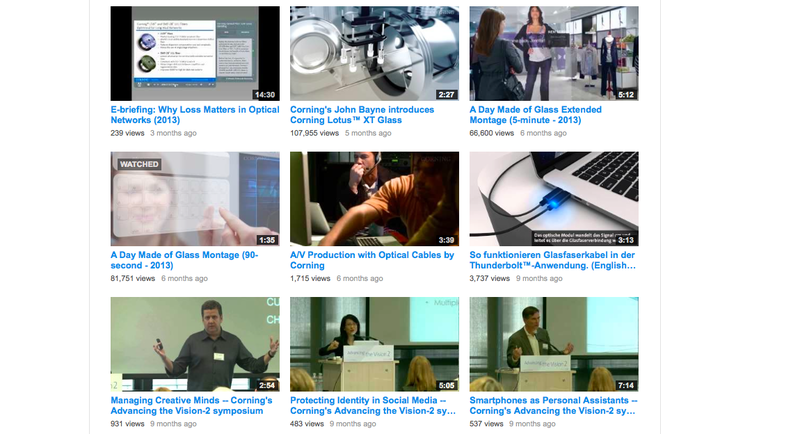 Corning proves that you don’t have to have the next big thing on YouTube. Even just a few hundred or thousand views means something. Each view is someone out there learning more about your businesses- perhaps those who have never heard of it before, perhaps customers, and perhaps future employees. An important item to note about the content as well is that many of it was created easily- it’s not “high end” quality. Instead, it’s informative, to the point, and relatable to their audience. It’s a key reminder to businesses that you don’t need thousands of dollars to create content. Corning uses Facebook slightly differently than YouTube. 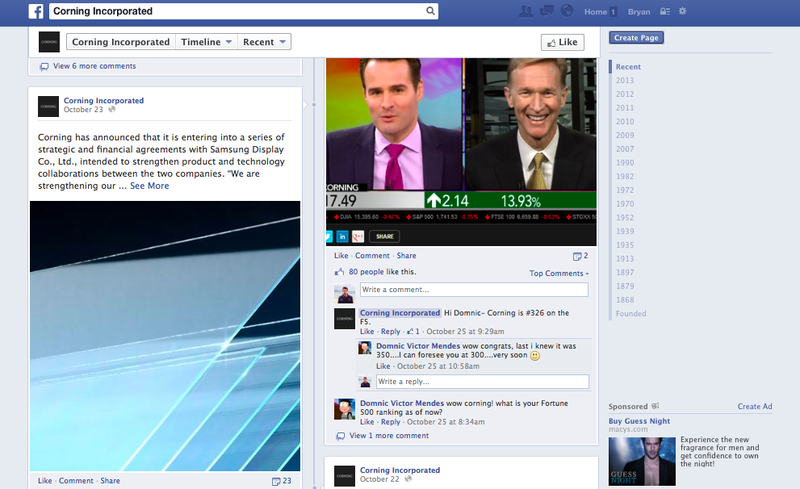 The Corning Facebook page is less tech-focused. Instead, the posts are focused on employee announcements (such as an employee losing weight), press releases, and historic photographs. Over the summer, Corning also posted quizzes for users to answer. The main use for Facebook appears to be to share highlights company achievements versus more informative pieces found on YouTube. This makes sense as users on Facebook are there for enjoyment. Those on YouTube are more likely to be searching for information (like a how-to video). Corning sees great engagement with users, particularly those that speak directly to users to perform an action (Tell us what you think, enjoy this quiz, etc). For engagement, we’re looking at comments, likes, and shares. The numbers aren’t astronomical, but again, the company is still getting the message out there instead of being a dark mystery on the platform.